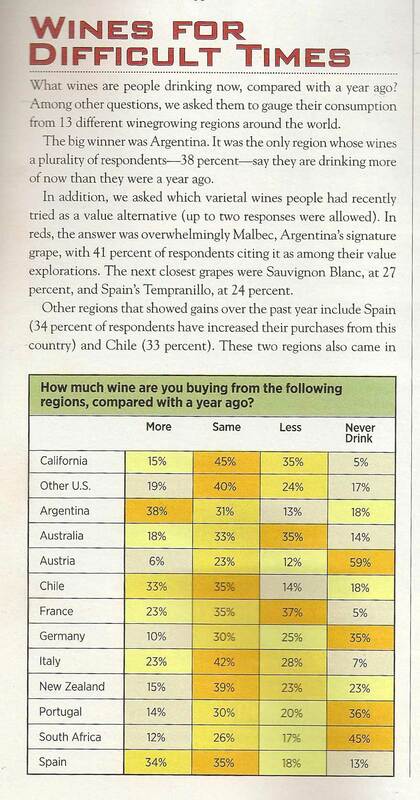 In a survey published this month by Wine Spectator, Argentina emerges the clear winner for US consumers as they search for wines displaying the right mix of quality and value. Given the uncertain economic times, consumers are shifting their focus to less costly wines that fall primarily in the $10-$20 category. This does not, however, mean that they are willing to sacrifice on quality, leading more people than ever to look for guidance from trusted critics and shopkeepers. Argentina emerged both as the only country people said they were drinking more wine from than 1 year ago and also the source of the most popular ‘value alternative’ in the form of Malbec, 41% of whom said it was their top value choice.